Tour the world in coffee! Each month of the tour we will ship 16 ounces of freshly roasted coffee. Want to let the lucky recipient know to look out for coffee each month? We provide a gift card that you can mail or give them in person! We start the process of creating truly special coffees by carefully sourcing our coffee beans. In some cases, selecting the individual lots of coffee on site at the farm. Once the coffee arrives at our roastery we work to showcase the best attributes of each coffee we roast. You can purchase a 3-month or 6-month subscription to our Coffee Tour. Shipping is included in the price. And, you can begin your coffee tour any month of the year. Bon voyage! Forms may also be filled out in the Red Cedar Coffee Co. Tasting Room in Berea. December 4, 2018 /by Anne D.
Have you been making your list and checking it twice? Our Tasting Room in Berea has a selection of freshly roasted coffee along with brewing equipment to delight any coffee lover. 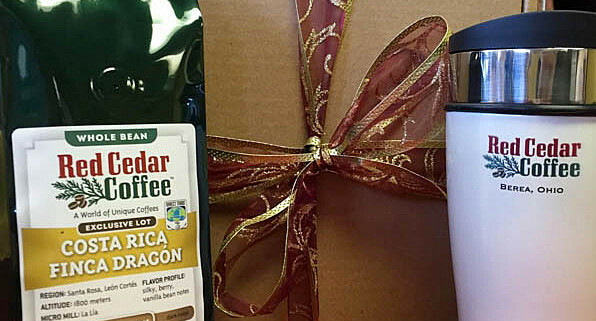 This is our Top 10 Gift list for your Coffee Drinker. All items are available in our Tasting Room. Keep your coffee fresh in this airtight container. The container fits a pound of whole bean or ground coffee. Available in stainless steel and ceramic. Includes 5 single pot packs of single origin and blends. Tour the coffee growing regions of the world one cup at a time. Includes 4-6 oz. packs of the world’s premier coffee. Available with whole bean or ground coffee. Send a pound a month of freshly roasted coffee to your recipient. 3-month and 6-month coffee tours available. A piece of art! Great for entertaining and highlighting the brightness of a coffee. No wonder this piece is part of the Museum of Modern Art’s display in Architecture & Design. This is a great pour-over coffee brewer because it has a reusable cloth filter. Brew your coffee, compost your coffee grounds and let the cloth filter drip dry. Having a clean coffee brewer and grinder is one of the steps often overlooked for brewing great tasting coffee. For many, this is their first brew method after a drip coffee brewer. Brews a full-bodied cup of coffee. Our Tasting Room has a fantastic travel French press mug. The new brü-stop technology separates the coffee from the coffee grounds after you press down the screen. It comes with a second lid that you can turn your French press into a travel mug. This grinder has 40 settings and has a hopper that holds 8 oz. of coffee. Grinder cleaning tablets (sold separately) will help keep your grinder working like a champ! We offer gift certificates good for any amount. Let your recipient choose their gift. November 21, 2018 /by Anne D.
The gift of great-tasting coffee is always appreciated! With the holidays approaching, keep us in mind for all your corporate gift needs. We love to create special gifts for your clients, employees, vendors, and even your conference! Check out our Corporate Gift Selection. New this year is our Coffee Bundle (see photo below) which is an assortment of 5 single pot packs. 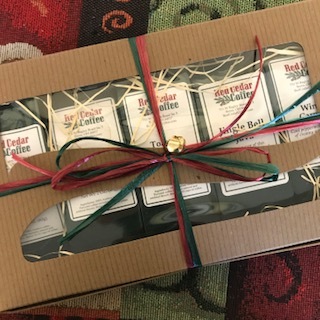 Corporate gifts from Red Cedar Coffee Co. are available for your company’s events year-round. Have your gift recipients finalized? Fill out our Gift List spreadsheet with your gift recipient’s information and send it to us to get the ball rolling. Please give us a call for more information or to place your order. July 29, 2017 /by Anne D.